A painting by Toronto artist Anna Clarey. Our cover photo this week is a painting by Toronto artist Anna Clarey. 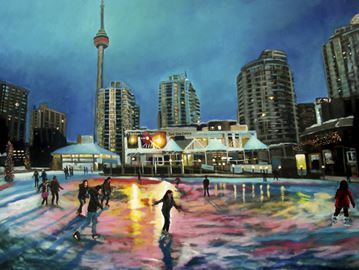 Titled Harbourfont Ice Rink (painted from a photograph by Tim Fraser), the acrylic painting showcases the downtown rink in all its vivid-hued glory. While Clarey typically works from photographs she takes herself, she was struck by Fraser’s shot and immediately wanted to paint it. Clarey loved painting up through her teen years, but life and work got in the way of her pursuing it much further. About 12 years ago, she was inspired to pick up a brush again after going on an art tour. “I just started teaching myself – painting flowers, a lot of local scenes and Beach stuff,” she said. Four or five years ago, her painting changed from a hobby to a full-time vocation. She quit work and began painting more regularly in her home studio. Acrylics are her medium of choice, in part because they dry quickly and allow her to work fast and partly because they are safer than oils when she is working from home. Now, Clarey primarily paints scenes from rural Ontario, making her oeuvre more cohesive and better suited to gallery shows.